We are a leading Manufacturer of high pressure cleaner machine hpc from Thane, India. 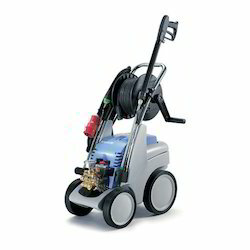 Being one of the reputed organizations in the market, we are engaged in offering an exclusive array of High Pressure Cleaner Machine. Our given cleaner machine is high on demand due to its superior quality & performance. This cleaner machine is developed by using finest quality of material & modern technology in accordance with the industry norms. In addition, this cleaner machine is obtainable in several specifications as per the varied requirements of the customers.